It is controlled electrically and it will only work when the ignition key is at MAR. 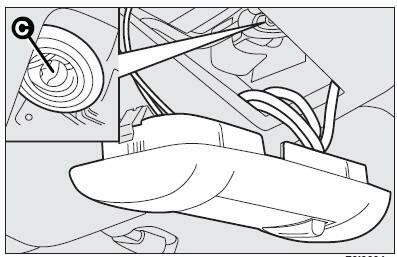 Sunroof is controlled by a switch. When you release it the roof locks in the position it is at that moment. Press switch to (A) (symbol). Press switch to (B), this is only possible when the roof is closed. Press switch to (B). Press to (A) (symbol) when the roof is in spoiler position. A sliding sunshade is fitted to lessen the effect of sun rays in the passenger compartment. when fully open, turn the screwdriver half a turn back until it clicks, then remove the screwdriver. if there is snow or ice on it: it could be damaged. the ignition key should be removed to prevent the sunroof from being operated inadvertently and harming anyone remaining in the car. Improper use of the sunroof can be dangerous. Before and during its operation ensure that any passengers are not at risk from the moving roof either by personal objects getting caught in the mechanism or by being injured by it directly.